Here are five ways you can become a better, more informed investor. From ways to get around fees to certain stock-picking strategies, there are plenty of investing concepts that many people don't know about. For example, did you know that you can open a new investment account with just a few dollars? Or, do you know how to invest for your future without paying taxes? In the interest of making you a well-informed investor and setting you up for success, here are five investing "secrets," courtesy of our experts. Selena Maranjian: One of the best-kept investing secrets I know is that you don't have to be constantly studying, buying, and selling stocks in order to get wealthy. In fact, that can hurt you. Studies have shown that frequent trading hurts results, due in part to commission costs and short-term taxes, but also due to investors succumbing to emotions, overconfidence, and impatience. Patience has been cited as a critical ingredient for investing success by none other than super-investor Warren Buffett, who noted, "Successful Investing takes time, discipline and patience. No matter how great the talent or effort, some things just take time: You can't produce a baby in one month by getting nine women pregnant." You don't need to buy esoteric high-flying stocks, either. In the chart below, check out the long-term average annual returns for a bunch of familiar names. In the last column, I'm including how much a single $10,000 investment would be worth after 30 years. Even just sticking with a simple S&P 500 index fund over the last 30 years would have increased your initial investment more than tenfold. Once you find companies whose long-term futures you believe in, aim to hang on for a long time, as long as they remain attractive. Doing very little and being patient is a good path to success. Matt Frankel: Although it's not exactly a "secret," in my experience far too many investors (particularly younger ones) underestimate the performance of tax-advantaged investing. Looking back to the chart in Selena's post, those are very nice returns, but they wouldn't be nearly as impressive if they were held in a taxable account. Not only would all of your investment gains be taxable once you sold, but you'd also get hit with a dividend tax every year along the way, which significantly slows your rate of compounding. Look at Johnson & Johnson, which as Selena correctly points out, would have turned $10,000 into $680,000 over the past 30 years if it was held in a tax-free account such as a Roth IRA, or would have effectively been bought at a "discount" in a tax-deferred account such as a traditional IRA. Assuming that 3% of that annual compounding came from dividends, and that you are in a 15% dividend tax and long-term capital gains bracket, it would reduce the compounded value to $604,257, most of which would then be subject to a 15% capital gains tax when you sell. All of a sudden, that $680,000 becomes approximately $515,000, just because you held it in a taxable account. Now, $515,000 is still a lot of money, but $165,000 is a big chunk of potential profit to leave on the table. Don't underestimate the power of tax-free or tax-deferred investing when planning your financial future. Sean Williams: One of the greatest secrets to long-term investing that far too few people understand is the power of dividends and the ability to reinvest them over time. I've often stated that dividends are the foundation on which great retirement portfolios are built. To add to that phrase, the greatest of the great portfolios are built upon dividend reinvestment. The idea here is that instead of simply seeking out companies that pay a dividend yield of 2% or 3% and pocketing the payment in your investment or bank account, you instead roll your dividend payment directly into more shares of the same stock. Owning more shares should lead to a bigger dividend payment, and the ability to buy even more shares. See where this is going? As an example, imagine investing $10,000 into a fictitious company -- let's call it Dividend Co. -- in 2015 and holding shares of this company until 2045. Let's assume Dividend Co. grows on par with the historic average of the stock market (7.6% per year), that it currently yields 3%, and that its dividend grows by 2% annually, which is a conservative number considering the annual dividend growth rates of some Dividend Aristocrats. After 30 years our investor who simply pocketed the dividend payments had $102,440 in total value after receiving $12,414 in dividend payments, and an 8.06% annualized return. However, our reinvestment investor finished with a total value of $138,769, had 54% more shares than he or she started with, and received more than $4,200 in additional dividend payments for an annualized return of 9.16%. That 1% extra in the annualized return might not seem like much, but it can make a world of difference come retirement. Dan Caplinger: It used to be that in order to invest, you already had to have a substantial sum of money saved up. One of the most unfortunate yet still well-kept secrets about modern investing is that you can now start to invest with only minimal amounts of money up front. There are several reasons for this. Explosive growth in mutual funds and more recently exchange-traded funds has made it easy to build a diversified portfolio with just a small investment, and many fund and brokerage companies allow investors to open accounts with as little as $50 to $100 as long as you make modest additions to your account on a monthly or quarterly basis. At the same time, rock-bottom commissions have made it more affordable to invest in individual stocks, making it possible to build up a fairly broad portfolio of a dozen stocks or so without paying hundreds or even thousands of dollars to your broker in fees. Finally, remote access through online and mobile applications has reduced costs for financial institutions, making it easier to offer services at reduced cost that make them accessible to those of limited means. Too many people never start investing because they think they need more money before they begin. Be sure you know the secret of how even small investors can take advantage of the life-changing wealth opportunities from the investing world. Jason Hall: The impact of fees on your returns can be enormous, and many people don't even know they're paying fees at all. Chances are, the mutual funds in your retirement account are costing you a lot more than you realize. This cost is measured in the "expense ratio," which is easy to find in the prospectus for every fund. An average actively managed fund can cost more than 1% per year, versus low-cost index funds that cost well under half that, with the cheapest funds as much as 95% less. The chart above shows the total returns of two Vanguard S&P 500 index funds. As you can see, the Vanguard 500 Index Fund Admiral Shares -- with its incredibly low 0.05% expense ratio -- had the best return, with the Vanguard 500 Index Fund Investor Shares' 0.17% expense ratio performing more than 2% worse over 10 years. 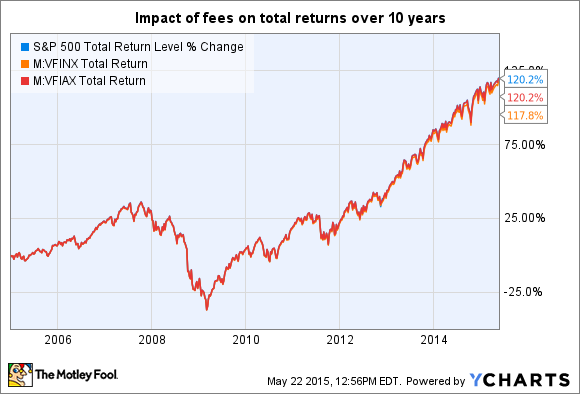 The small difference in fees in the example above would cost about $240 in returns on a $10,000 investment. Multiply it out over 30 years, and it could cost you $3,200 based on historical returns. That's only paying a measly 0.12% more in fees per year. And that's in some of the cheapest funds out there. If you were instead investing in an actively managed fund with a 1% expense ratio, you would lose $19,000 in returns to fees over 30 years. The lessons? Don't assume you're not paying fees. Don't assume similar investments cost the same. Most important, don't assume even seemingly small fees won't make a big impact in your returns.